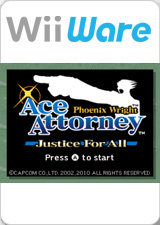 In Phoenix Wright Ace Attorney: Justice for All (逆転裁判2), Phoenix Wright is back, as the second game in the popular Ace Attorney handheld franchise comes to WiiWare! As Phoenix Wright, you’ll play through four shocking new cases in first person perspective! The game features two unique game play modes. In Investigations Mode you’ll survey crime scenes, interview witnesses and gather evidence. You’ll then present findings, listen to testimonials and examine witnesses in Court Mode. Justice For All also includes a new “Psyche-Lock” feature that allows Phoenix to use a line of questioning to reveal inconsistencies in witness testimony. The graph below charts the compatibility with Phoenix Wright Ace Attorney: Justice for All since Dolphin's 2.0 release, listing revisions only where a compatibility change occurred. This page was last edited on 26 January 2018, at 12:20.